On 17th November 2017, the New York Times carried an op-ed by Jay-Z entitled ‘Jay-Z: The Criminal Justice System Stalks Black People Like Meek Mill’. Meek Mill is a 30-year old rapper who, at the age of 19, received an 8-month sentence for convictions related to drugs and firearms. Since his release, ‘for his entire adult life’, he has been on probation. Meek Mill had been arrested in March 2017 after an altercation at an airport but all charges had subsequently been dropped. In August 2017, he was arrested for ‘popping a wheelie’ on a motorbike on the set of a video he was shooting. Those charges, Jay-Z reports, will be dismissed if he stays out of further trouble. But that didn’t stop Meek Mill being sentenced to two-to-four years in prison for probation violation. “[i]nstead of being a second chance, probation ends up being a landmine, with a random misstep bringing consequences greater than the crime. A person on probation can end up in jail over a technical violation like missing a curfew”. “As of 2015, one-third of the 4.65 million Americans on some form of parole or probation were black. Black people are sent to prison for parole violations at much higher rates than white people. In Pennsylvania, hundreds of thousands of people are on probation or parole. About half of the people in city jails in Philadelphia [Meek Mill’s hometown] are there for probation or parole violations. We could literally shut down jails if we treated people on probation or parole more fairly. And that’s what we need to fight for in Philadelphia and across the country”. One month later, on 18th December 2017, the non-profit website Next City ran a more detailed story headlined ‘Parole and Probation Reform is Bigger than Meek Mill’, opening with the line ‘[o]ne in every 52 American adults lives under court supervision, costing taxpayers and making it harder for families to move on post-incarceration’. These stories raise some crucial issues. I’ve already written in previous posts about the scale of supervision and about who is subject to it. The third dimension that these stories surface concerns how supervision is constructed in practice (as a ‘landmine’ or as a ‘second chance’); pointing to the issue of enforcement and thereby to the complexities of probation and parole’s relationships with mass incarceration. In my recent blog post on ‘Blankface’ and the ‘Malopticon’ (link below), I shared an article which, in a sense, explores the experience of supervision when constructed as a landmine rather than a second chance. Thinking about the difference between Teejay’s and John’s experiences, and between landmines and second chances, seems topical today with the publication of a report by Her Majesty’s Inspectorate of Probation (in England and Wales) based on a thematic inspection (of the National Probation Service and the [privatised] Community Rehabilitation Companies). “…good enforcement relies on good quality probation supervision. 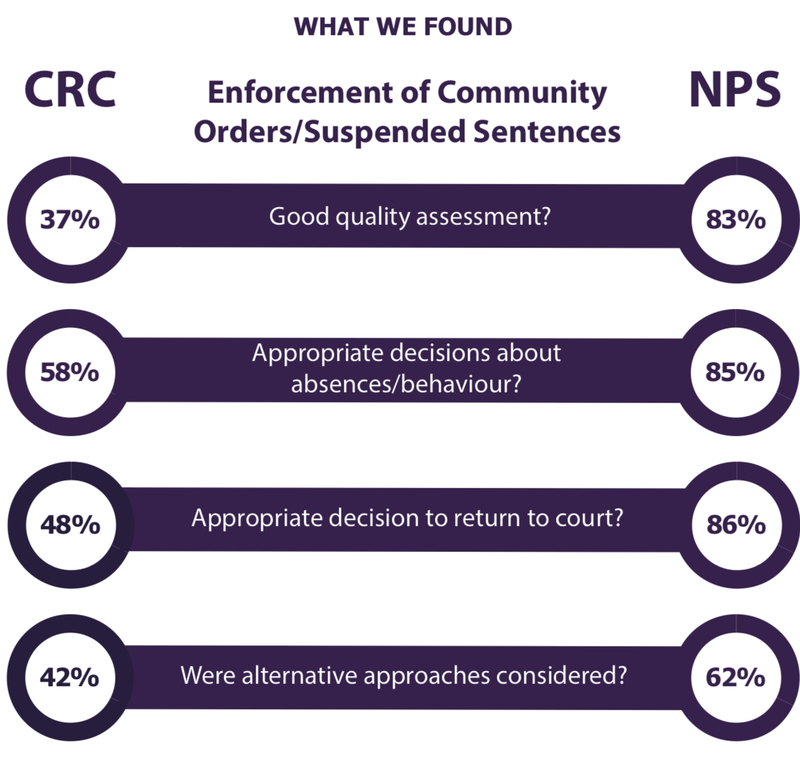 CRCs [Community Rehabilitation Companies] focused on contract compliance, but not seeing people often enough, or not engaging meaningfully with them, are inevitably behind the curve on enforcement, as staff may not know when enforcement is called for, or when purposeful work to re-engage the individual would be better for them and for society. I suspect this is the biggest issue undermining effective enforcement today: that, in many CRCs, the case management itself is insufficient to enable good enforcement decisions. Instead, poor supervision is more likely to lead to reoffending and, for some, another round of imprisonment”. There are some important clues here about what might make the difference between landmines and second chances. https://www.nytimes.com/2017/11/17/opinion/jay-z-meek-mill-probation.html, accessed 15th January 2018.
https://nextcity.org/features/view/parole-and-probation-reform-is-bigger-than-meek-mill, accessed 15th January, 2018.